Rosé Season is Upon Us! The sunny, spring weather we’ve been dreaming about all winter long has finally arrived. This means it’s time to treat ourselves to just the right beverages that complement warmer temperatures. Here at Baker Distributing, we recommend a drinkable Rosé wine. Let’s take a look at some of our new offerings for 2017. This wine is made locally right in Cambridge, Vermont. It is dry in taste and full of raspberry flavor that complements its vibrant acidity. It’s made using Frontenac and Cayuga White grapes. Fun Fact: The Rosé is named after the Boyden daughters Juliette and Laurence. Enjoy a delicate, fruity flavor of strawberry and citrus when you uncork a bottle of this Rosé. It is rich with aromas of watermelon, nectarine, ruby red grapefruit, lilies, and orange blossoms. Treat yourself to a blend of blood orange, kiwifruit, passionfruit and coconut flavors, mingling with the aromas of watermelon and orange creme. This Rosé would be ideal for a relaxing afternoon in the sun. With Easter and Mother’s Day just around the corner, there are plenty of reasons to celebrate with the ones you love. Keep these rosés in mind when you’re looking for the perfect wine for the occasion. Happy sipping! Happy St. Patrick’s Day from the Baker family to yours! In honor of one of our favorite holidays we have compiled three classic Irish recipes all made using Bakers Irish brands of course! First up is Smithwick’s Irish Beer and Cheese bread! This bread is hearty enough to be a meal in itself but we prefer it as a before dinner snack or paired it with eggs and bacon for a filling breakfast. Next up we have an Irish classic – Guinness Beef Stew! This recipe is great for family dinners or a small dinner party. Last but not least we have an Irish twist on an American classic – Magners Irish Cider Mac & Cheese. The perfect combo of sweet and savory, we cannot get enough of this stuff! Be sure to comment and let us know which one is your favorite! Spring is in the air and on the shelves here at Baker! We have a variety of spiked seltzers in the warehouse including Truly Spiked & Sparkling, Smirnoff Spiked Sparkling Seltzer and for the kids Polar Seltzers. Truly’s Spiked & Sparkling comes in four varieties: Colima Lime, Grapefruit & Pomelo, Sicilian Blood Orange, Pomegranate. All four beverages offer a fruity flavor at half the calories of most pre-mixed adult beverages. Even if you aren’t counting calories, Truly, comes in small cans that can be easily toted to the beach making it the perfect refresher on a spring break vacay. Aside from being a great drink for the beach, Truly can be used to make tons of tasty mixed drinks like this Sangria! After mixing up our own batch we can we have to say this quite delicious. Fruity and sweet yet still refreshing – perfect for a light lunch on the shore or dinner with friends. Smirnoff Spiked Sparkling Seltzer comes in three varieties: Watermelon, Cranberry Lime and Orange Mango. Unlike Truly these guys are only sold in cans and a variety pack that is perfect for a barbecue or day on the water. Our team has been loving the Cranberry Lime flavor so we decided to mix up our own little twist on the Moscow Mule. Spiked Seltzer may be all the rage but when it comes to vacations it’s always nice to have something for the kids as well. 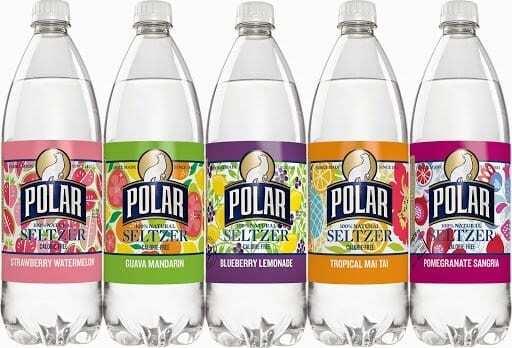 Polar seltzers are a great substitute for soda without sacrificing the fruity flavors kids love, just the sugar. Polar comes in a variety of sizes and flavors making it an easy beverage for on the go. Our team even made our own Polar mocktails! It’s that time of year again in Burlington, in just two short weeks the streets fill with gold, green and purple and the community comes together for three full days of fun and philanthropy! The Baker family is excited to once again be participating in this amazing event and we are so proud of our friends over at Magic Hat for putting this on. All events over Mardi Gras weekend will serve to bring awareness and support to the Vermont Foodbank. Over the years, Magic Hat Mardi Gras weekend has raised more than $250,000 for the Vermont community and this year will be the 22nd anniversary of the event. Aside from great beer and great company this event offers a number of events including live music, a parade, food trucks, the fun run and more. This year the event will feature two special guests Steve Lemme and Kevin Heffernan of Super Troopers. For a full list of activities and details click here. We at Baker pride ourselves on being members of the Vermont community for the past 52 years and it is events like this that remind us just how lucky we are to live and do business here. The mission of the Vermont Foodbank is to gather and share quality food and nurture partnerships so that no one in Vermont will go hungry. Three locations throughout the state including Barre, Brattleboro and Rutland, help to feed the 1 in 4 Vermonters who are struggling with hunger. Last year’s Mardi Gras celebration raised enough funds to provide over 50,000 meals for our neighbors in need. Volunteer to help with the parade and sell beads, sign up for the Fun Run, or buy some stylish Mardi Gras beads. The Baker Distributing family will be showing their VT pride at the Lake Champlain Pond Hockey Classic this weekend! Presented by Labatt Blue – this event is tailored to it’s participants starting with the tournament all the way down to the after game activities. We are excited to see our friends at Labatt putting on such an awesome event yet again for the Vermont community and across the country! Boyden Valley Winery & Spirits will be participating in the Vermont Grape and Wine Council’s Annual Wine & Chocolate Weekend, Saturday & Sunday, February 11th & 12th, 2017. Join us for a fun and romantic wine and chocolate experience from 10am-5pm at our winery in Cambridge, Vermont. We are proud to feature chocolates from local chocolatiers , STiR Chocolates and Snowflake Chocolates, with FREE Chocolate and Wine pairings. Experience the decadent flavors of Boyden Valley wines, cider, and Vermont Ice crème liqueurs perfectly matched with dark chocolate truffles infused with our liqueurs and wine, cranberry orange bark, and sea-salted caramels. Valentine’s Themed Cocktail Tasting made with Boyden Valley Wines, Ciders, and Liqueurs will be the perfect way to experience the variety of ways you can enjoy our products. The cocktail tasting will come with a handy laminated recipe card so you can mix up your favorite cocktails at home and fall in love all over again! One stop shopping is our goal this year to make all your Valentine’s Day needs easy and thoughtful with the perfect gift set including Boyden wine, local chocolate, and beautiful white roses in a galvanized bucket with chalkboard for your personal message to the one you love. STiR Chocolates on site with more chocolate samples & products to purchase. Snowflake Chocolates on site with more chocolate samples & products to purchase. Beautiful gifts featuring Boyden Wine, Local Chocolate, & White Roses in a reusable bucket. FREE to attend. No Reservations needed for the weekend event. Make your reservations Today! The dinners book up quickly with limited capacity of 50 people per night with seatings available every 15 minutes from 5pm-7pm. Call 802-644-8151 to lock in your reservation with a credit card. Contact Boyden Valley Winery & Spirits at (802) 644-8151 or by email at info@boydenvalley.com with questions. No Reservations necessary for Daytime Weekend Event. Just because the holidays have ended doesn’t mean you should sacrifice all the good food, sweet treats & yummy cocktails (even if that was your resolution – we all deserve cheat days.) If you’re anything like us then you probably have a lot of leftover beverages from the holidays and we want to help you put them to good use. That is why we found three tasty recipes that incorporate your favorite Baker brands – and if you don’t have these drinks on hand all it takes is quick trip to the market for these recipes to come alive! The cold weather is here to stay so why not warm up with this deliciously sweet hot cider! Second we have a match made in heaven: cheese and beer! We recommend using Otter Creek’s Russian Imperial Stout for this recipe and for our resident vegetarians feel free to leave out the meat or make substitutions. For cooking details click here. To finishing things off we found this incredible dessert recipe. Spoiler alert – it’s Red Wine Brownies! We recommend 14 Hands Winery 2014 Merlot for this recipe. For cooking details click here. Comment and let us know your favorite! It’s that time of year again, the snow is beginning to fall, the lights are on the tree and in just a few short weeks friends and family will be gathering to celebrate for the holidays. That’s why at Baker we are running our Nor’Easter Wine Spectacular – because are you really ringing in the New Year if you don’t cheers with a little glass of bubbly? If you’re shaking your head right now then you see where we’re coming from! We have some amazing varieties on sale from Korbel to Mionetto to Chandon and more until the end of December. Pair yours with a fresh cheese plate, decadent dessert or enjoy a glass over dinner with friends and family. Whether you’re into Brut, Prosecco, Rosé, or just a delicious glass a Red – there is something for everyone! The event is a culinary showcase, featuring Rutland and Burlington’s top culinary masters. This rare opportunity is made possible by participating chefs graciously donating their time and talent to create a food experience beyond any available at a single location in Vermont. Each tasting is thoughtfully created to tantalize the palette of even the savviest “foodie” and highlight the chef’s unique and exceptional talents. Amidst a lively party atmosphere and exciting entertainment, guests will enjoy exquisite cuisine, spirited cocktails and enticing raffle and auction packages. We will be attending both events and representing the wines of Constellation Brands and the beers of Switchback Brewing Company. We will be also be making a donation to March of Dimes to help improve the health of babies by preventing birth defects, premature birth and infant mortality. Join us for the 2016 March of Dimes Signature Chefs event, led by Chair Matt Peters of GE Aviation, on Sunday, November 6th, at the Rutland County Club. Purchase tickets for the event here. Join us for the the 2016 March of Dimes Signature Chefs event, led by Event Chair Gay Godfrey, on Sunday, November 13th, at UVM Davis Center in Burlington. Purchase tickets for the event here. Interested in becoming a sponsor? By purchasing a table or donating during Fund the Mission you are helping to ensure one day all babies will be born healthy. Contact Brooke Duffy BDuffy@marchofdimes.org for sponsorship levels and how you can get involved.